Yes, it really is. Well, not quite. It is the Museum of the Moon, the work of British installation artist Luke Jerram. It is an internally lit, 1:500000 inflatable scale model of the Moon with detailed imagery of the Moon’s surface by NASA’s Lunar Reconnaissance Orbiter. While its surface is flat, the lighting and the detailed imagery give the impression of texture. It will be on display at the Piarist Church in Kolozsvár/Cluj-Napoca until December 14. It is part of the Lights ON Romania initiative, a competition for designers, artists and architects to devise new and artistic ways of illuminating cities during the holiday season. 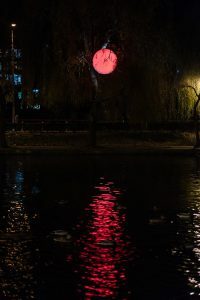 Another, somewhat less intrusive example of the 13 light installations in downtown Kolozsvár is the Red Sun by Russian contemporary artist Leonid Tishkov, tucked away between the trees of the city’s central park. The Facebook page of Lights ON Romania quotes Roamn Catholic archdeacon Lóránt-Zoltán Kémenes saying that “the presence of the Moon will reinforce the Church’s message that we should look upward”. But having such a display in a church – incidentally the first Baroque church in Transylvania, completed in 1724 – is not to everybody’s liking. István Takó, Catholic priest at the Kolozsvár University said the idea might not have been properly thought through: he said it is not certain that people should be attracted to the church for such an earthly reason because it isn’t necessarily conductive to the spiritual immersion people go to church for, especially in the Advent period. In order not to cause undue disruption, the project has volunteers in front of the church advising visitors to return after an ongoing service was finished.